New York University is a highly competitive school and its admissions statistics make New York University one of the 50 most competitive schools for undergraduate admissions globally. 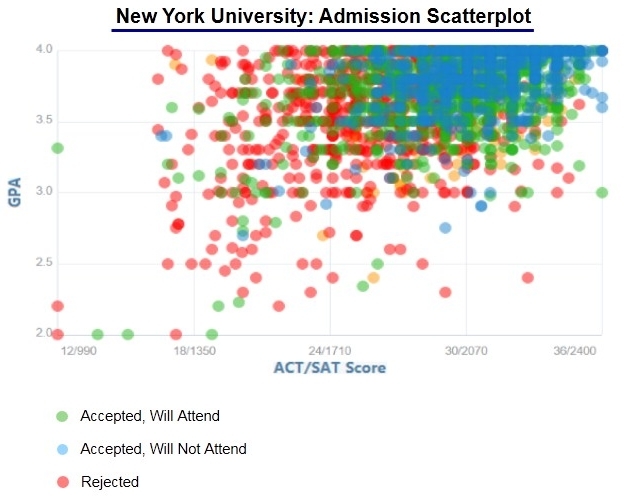 Similar to the trends across all top schools, New York University acceptance rates have continued to decline over the past 8 years and will almost certainly continue to do so into the future. The Class of 2022 was the single most challenging years to be admitted to New York University ever. For the Class of 2022, 75,037 students applied to New York University of which 15,722 students were accepted, yielding an overall acceptance rate of 21.0%. Overall applications increased by 11.6% over last year (2021 to 2022) from 67,232 to 75,037. Founded in 1831, New York University was built on Albert Gallatin’s idea to create “a system of rational and practical education fitting for all and graciously opened to all.” Since that time, NYU has become one of the largest private research universities in the United States and is one of only sixty member institutions distinguished in the Association of American Universities. Centralized in the heart of Manhattan’s Greenwich Village, NYU is in one of the most creative and lively communities in all New York. In addition to the Manhattan campus, NYU also has a Brooklyn campus, and Abu Dhabi and Shanghai also serve as extensions campuses for the university. New York University states its mission to be “a top quality international center of scholarship, teaching and research”. NYU has continually achieved its goal by maintaining its ability to attract and retain outstanding faculty who are leaders in their fields and who are able to encourage students through creative programs that create an intellectually rich environment. Although NYU has a number of popular majors, such as degrees in Social Sciences, Business, General Studies and Humanities (just to name a few), NYU is most widely known for its exceptional ability to attract top talent interested in drama and film. The renowned Tisch School of the Arts offers both undergraduate and graduate programs in acting, dance, dramatic writing, film, television and more. Notable alumni from the Tisch School include popular celebrities such as directors Martin Scorsese and Spike Lee; actor, writer and director, Woody Allen; and actresses Whoopi Goldberg and Angelina Jolie, plus many, many more. NYU enrolls approximately 40,000 students annually in its eighteen schools and colleges. When NYU began in 1831, it started with a mere fourteen professors and lecturers. Today, the university has more than 3,100 full-time members throughout its various departments including the humanities department; sciences and social sciences departments; law, medicine and business departments; education; fine arts, studio arts, performing arts and cinematic arts departments; music; social work and more. Both students and faculty have access to a full range of extracurricular activities and services that bolster the excitement of the university’s academic culture. From medical attention to discount theater tickets, to academic facilities including nine libraries and dozens of specialized centers, to student services, residence halls and dining locations that everyone has access to—NYU has practically everything one could want or need in a university.